New York will display princess Grace's gowns, jewelry, photos and letters. "Grace, Princess of Monaco" will include memorabilia from "The Grace Kelly Years," a retrospective held this summer in the Principality of Monaco. The free exhibition will span the life of U.S.-born Grace Kelly, from Hollywood star and style icon to princess, as well as wife, mother and humanitarian. It will run Oct. 15-26 at the Manhattan galleries of Sotheby's auction house. It will set the stage for a series of events, including the 25th anniversary Princess Grace Awards Gala and an arts benefit. "Grace Kelly was a great friend of my father's from her days as an actress in Hollywood to her reign as Princess of Monaco," said James G. Niven, vice chairman of Sotheby's and son of actor David Niven. "She took me under her wing when we lived in France, and I was lucky to be invited to palace events as a young man and experience the world she inhabited firsthand." The exhibit will include a blue satin dress and cloak by Hollywood costume designer Edith Head, which Kelly wore while accepting an Oscar for her role in "The Country Girl." The Oscar statuette will be on view alongside the gown. - A beige silk shirtwaist dress she wore as they announced their engagement. - Her engagement ring, a 10.47 carat emerald cut diamond set with two baguette diamonds and mounted in platinum. She also wore the ring in the movie "High Society." 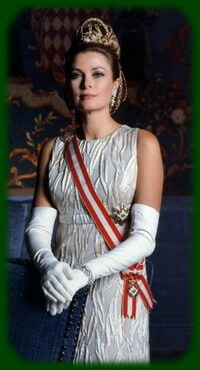 - A tiara which also was worn by her daughter, Princess Caroline, on a Life magazine cover. Two of the princess's outfits will be auctioned at the arts benefit: a Givenchy-designed sleeveless dress she wore on a visit to the White House with former President John F. Kennedy and Jacqueline Kennedy, and a ball gown she wore in "High Society." Said Niven: "The pieces selected for this exhibition highlight her great beauty and style for which she is so well-known, and her personal letters and correspondence show that she was open, friendly, interesting and had a great sense of humor."